A wooden bridge was constructed at Lea Bridge and the rights to Jeremy's and Smith's Ferries purchased and extinguished. An old ford, presumably to the south of Lea Bridge, was also removed. 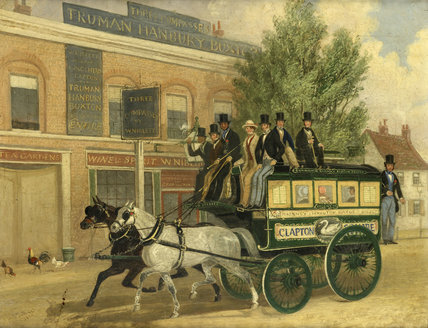 Residents of Hackney driving carts to and fro across the bridge to collect Hay from Leyton Marshes or to graze horses and cattle there were exempt from the tolls by the Turnpike Act. The Turnpike was much narrower than the current Lea Bridge Road. The road was widened to the north side in the late 19c. to accommodate two way running trams when the old iron Lea Bridge of 1820 was replaced. The City of London holds a copyrighted photograph of the Lea Bridge Road looking westward c.1890, which can be�viewed here�(opens �a new page).